Westside Christian College student Alania Suttie stands on the blocks, ready to dive into history. After a decade of almost daily training, her dream of representing Samoa at the 2016 Rio Olympic Games may just become a reality. Alania enjoying a well-deserved break after smashing long-standing college records at the 2016 College swimming carnival. Alania beams with excitement at the thought of representing her country: “The Oceania Championships are being used as the trials for the Samoan national team. This is all I’ve ever wanted”. 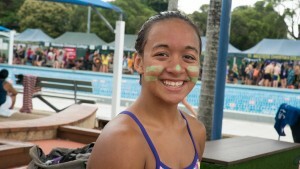 The Year 12 student already holds four Samoan national records in four events. In 2015, she laid claim to the Women’s records for 200m and 400m freestyle, 200m butterfly and the 200m individual medley. The Queensland Times recently published an article on Alania’s journey. Click here to read it.